Blue Hill Farm VA is a working hobby farm with a charming historic farm house built in 1895 on 36 scenic acres in the Shenandoah Wine Valley located in historic Clarke County, Virginia. The perfect getaway for everyone including your pets - we are pet friendly! Come explore Clarke County and Frederick County and all it has to offer - wineries, breweries, cideries, historic sites, Shenandoah National Park, the Shenandoah River, Sky Meadows Park, golfing, Abbey Monastery, hiking, antique shops, shopping, thrifting, Museum of the Shenandoah Valley, Locke Country Store, Watermelon Park, and Arboretum of Virginia, picturesque country roads. Plan a day trip to Shenandoah Nat'l Park, Harper's Ferry, Front Royal, Shepherdstown, WV or Charles Town WV. Finish the day in the hot tub and enjoy the stars in a light pollution free sky! I am a city dweller with a love of the country side as long as I have the option to get to the city if needed! #over50fabfarmlady Love anything vintage and made in the USA. Love all animals and gardening! Best quote: We don't stop laughing because we grow old, we grow old because we stop laughing! 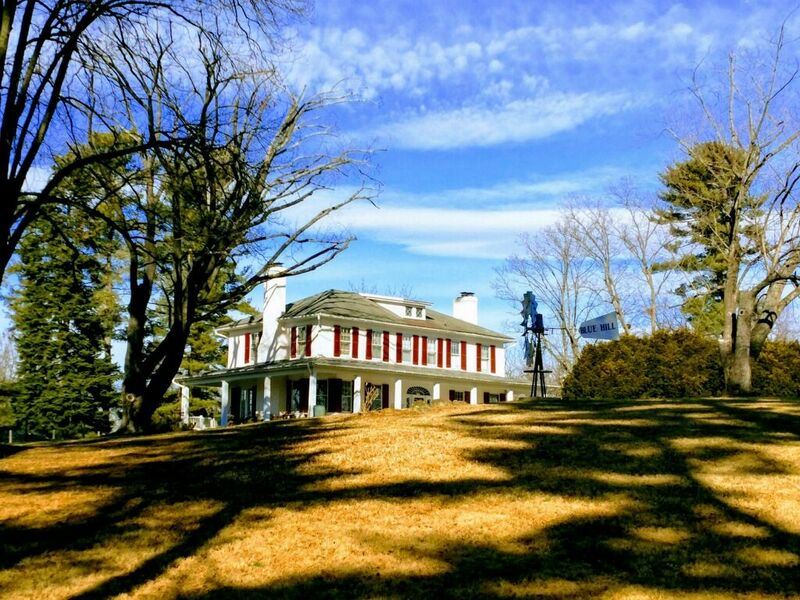 We choose Blue Hill because we feel in love with the house and the beautiful country setting - you can see the mountains and we are surrounded by 36 acres - 5 acres of fields and the rest is wooded and we are close to the Shenandoah River, Middleburg and Winchester. Blue Hill also offers us the opportunity to get away from the city but is close enough to DC that the the drive is relaxing and if we want to do something there are tons of options - so we can just relax and do nothing or we can plan a weekend of fun things to do! Blue Hill is a unique home - the words comfy and inviting are the words most often heard from guests! There are steps to the second floor and steps to get into the house. Events for large groups i.e. weddings, wedding repetitions, large dinner parties, etc. can be accommodated for an additional fee based on group size. Please contact send an email to bluehillfarm105weddings@gmail.com. What a lovely place. Thanks to Carla and Mark for their assistance. We will be back, for sure! So beautiful there and the location is great. The large windows framed the snow that was falling upon our arrival and made us pause to take it all in and added to the country ambiance. Enjoyed wildlife watching and sitting in the sunny breakfast room for our morning coffee with the toasty heated floor! Home is very comfortable and spacious and has everything you need. Will come back again. This was a great home, plenty of space. Nice sized bedrooms & plenty of areas to relax. Very clean, kitchen well equipped. Will definitely return! Beautiful house and wonderful stay. We had a girls weekend getaway. House was great for a large group. Close to Winchester and several wineries. Carla was great to work with. I just stayed at this beautiful property with three other authors in my writing group and it was the perfect writing retreat spot! Beautiful house in a serene setting. Enough bedrooms and bathrooms for privacy, and plenty of areas to spread out and write and gather. It was big, yet cozy. The Farm Manager Mark was super helpful and responsive, as was the owner Carla. We were expecting snow, and both kept checking in on us (via text/email) to make sure we had everything we needed, and to let us know they'd come help us clear any snow to get out, etc. So nice. We got food one day at The Locke Store and headed to the Berryville Grille for lunch one day, all in close proximity. Our only regret was that the snow caused us to cut our weekend short by a bit. But we all agreed that we will return to the house for future writing retreats. Highly recommend the house and the great hospitality made it worth returning. Great house for a weekend getaway! Spacious, cozy, and beautiful. •	The Shenandoah River follows lazily along the foot of the Blue Ridge Mountains and provides both great scenic views and an up close experience with nature. The American Bald Eagle, Blue Herons, Deer, Red Tail Hawks and Osprey are just a few of nature’s guardians that rule this special landscape. •	Nalls Farm Market - best apple dumplings! Or just relax in the hot tub at Blue Hill and watch monarchs, finches, swallowtails and deer and the occasional wild turkey! The HomeAway rate rate is for vacation rentals. For bachelorette/bachelor parties, small weddings and receptions there is an event fee if the number of guests exceeds 20. Please inquire for details.